Great news! Laurie R. King has created a free Common Core Guide for THE BEEKEEPER’S APPRENTICE to share with you (and your students and patrons)! The guide includes guided comprehension & discussion questions, vocabulary lists & worksheets, supplemental research materials, even chapter quizzes & tests, all in a ready-to-print format. (Yes, with a separate teachers’ answer packet, as well!) All of this in addition to the BEEKEEPER book discussion guide and Laurie’s suggested background reading. 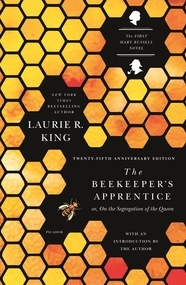 “Now, I’d always thought that BEEKEEPER could be a useful introduction to the Twentieth Century: World War One, the women’s movement, roots of conflict in Europe and the Middle East, the huge social and technological changes—all that plus Sherlock Holmes & villains & hansom cabs &—well, let’s just say this is a book that I would have loved to study in school. Click here to download THE BEEKEEPER’S APPRENTICE Common Core Guide.